Starting this year (2018), we are set to save an extra $2,000 to $3,000 of our income. This savings isn’t coming from cutting our cable (already did that) or eating out less (we never eat out anyway). These thousands of dollars are being saved through tax optimization. Based on the current tax law and our income situation, we plan to pay $0 in federal tax this year on a six figure income! Yep … that’s right. No federal taxes this year for our family. This strategy is completely legal. Nothing shady here. By taking advantage of some tax breaks, retirement plans, and careful planning … we will put a few thousand dollars back in our net worth. Here is a snapshot of our current tax situation. For the purposes of this exercise, I modified a few of the salary and deduction amounts from our current situation … but they are very close to actual amounts (see figure #1). It’s just easier to explain our income when I round to whole numbers … in my opinion. Our current tax situation for 2018 (after the recent tax law changes) has our family of five (3 kids and 2 adults) owing no federal tax this year. For comparison, in 2016 we paid $2,894 in federal taxes and paid a similar amount in 2017. The current year (2018) tax bill will be lower for a couple reasons. First, the tax cuts have helped our family … especially from the child tax credit. We have a lot more free money to deal with this year compared to last year. Second … unlike last year … we are now optimizing our tax situation to fit with the current tax bill and our income. By leveraging a few tools to defer our income, we can make sure to owe no federal taxes in 2018. Note – This exercise only covers federal taxes. Our state taxes will be different and we will still have to have payroll taxes on our W-2 income. So what tools are we using to get to a 0% tax rate? I have adjusted our gross salary to an even $100,000 of W-2 income for this example. Our income is a little bit higher than this amount. In order to lower our federal taxes, we need to reduce our taxable income. For starters, we will cover our pre-tax payroll deductions. Note – We are planning to file our taxes – Married Filing Jointly. The first reduction will come from a mandatory pension deduction of 6%. So right off the top, $6,000 comes out of our check and into our pension fund … reducing our taxable income. This is a mandatory deduction … but a good one. Next, I have a couple different options for work place retirement accounts – 457 and 401k. For now, I only deposit money each check into our 457 account … which helps to reduce our taxable income. The annual limit is $18,500, but we will only put in $12,000 for 2018. In the future, as our income grows (and we want to avoid paying federal taxes) we can add another $6,500 into this account. We also have the option (in the future) to put another $18,500 into a 401k account at work … which would reduce our taxable income even further. The final payroll deduction (to help lower our taxable income) is for our benefit plans. Medical, dental, vision, life insurance, etc. deductions take out another $8,500 of pre-tax dollars. Our combined payroll deductions have reduced our taxable income by $26,500, which gives us taxable income of $73,500. The next item we need to consider are any increases or decreases to our income from investments. We need to adjust our income to include any interest or dividends we expect to earn over the year. For now, I am estimating about $3,300 in dividends from stocks we own in our taxable accounts. As the year goes on, we can get a better understanding of how much dividend income we will earn for the year and optimize even further if need be. In addition, I expect another $300 of income from interest. The good news is that we will have a $3,000 carryover capital gains loss from this year … so our net addition to our overall income is $600 … which increases our taxable income to $74,100. Another piece of good news that we will cover later is that we can take back dollars from qualified dividends … which is the majority of our dividend income anyways. Now we will cover a few additional deductions available to us … outside of payroll deductions. 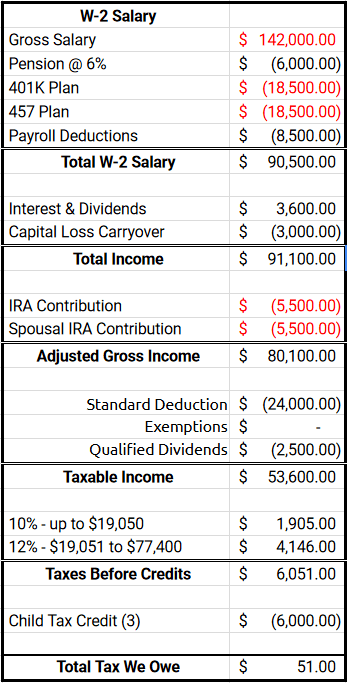 My wife and I both have the option to contribute up to $5,500 each for the year ($11,000 total) to an IRA. If the money goes to a traditional IRA, then we can use those funds to reduce our taxable income even further. So far this year, we have only invested $100 into my IRA … which reduces our taxable income down to $74,000. For now, we don’t need to reduce our taxable income any further to pay $0 federal taxes … so we have considered putting our money into a Roth IRA instead. However, as our income grows … this is another bucket to put money to help defer more of our income. As part of the new tax bill … there are some deductions and credits that are available to us as well. There is no doubt, we will be taking the standard deduction for married filing jointly of $24,000 for 2018. Our mortgage interest, property taxes, and other charitable deductions won’t come close to this number. Taking the standard deduction will bring our taxable income down to $50,000. We can also take back off approximately $2,500 of qualified dividend income … which puts us at $47,500. I am estimating our qualified dividend income off of our 2017 amounts. So before any child tax credits, we will be taxed on $47,500 for 2018. For the new federal tax brackets, we only really care about the first 2 … since our taxable income is so low. This means our first $19,050 of income earned will be taxed at 10% or $1,905. The remaining $28,450 of income we have leftover will be taxed at 12% or $3,414. So without any child tax credits, we would owe $5,319 in federal taxes after making $100,000 in W-2 income. The good news for us, is that our $3,000 in child tax credits last year (2017) doubled to $6,000 in 2018. So based on this credit, we won’t owe any federal tax because our tax liability is less ($5,319) than our available credits ($6,000). It actually gives us a bit of leeway to increase our income and still pay $0 in federal taxes for 2018. 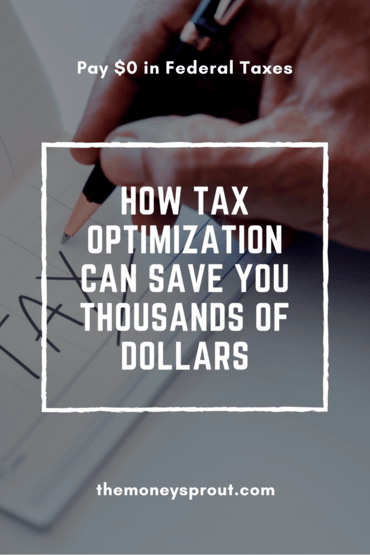 If you haven’t built out your tax optimization calculations … I strongly encourage you to do so. I never paid much attention to our tax optimization prior to 2017 and regret it every day. How Much More Income Can We Earn? In order to reach financial independence sooner … I have been exploring opportunities to earn side income. We have a couple possibilities which include – my wife working part time, me picking up some freelance work, earning blogging income, etc. But one of the issues with earning more income … is the perceived tax implications. With a 6-figure income already, I have been concerned that earning anything more from a side hustle wouldn’t be worth the tax hit. 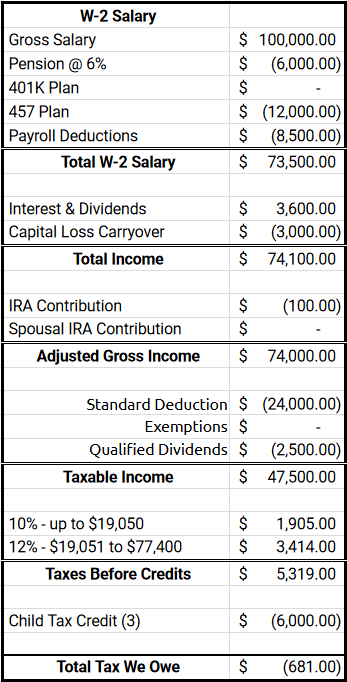 Well … based on our tax optimization calculations I have been playing around with … I have calculated we could earn an additional $42,000 of income and would owe $51 in federal tax. That seems to be a pretty good amount of extra income for such a little bit of tax. Note – This calculation does not consider any state tax liability nor does it factor in any payroll taxes for social security which would need to be paid. Paying $51 in federal taxes on $142,000 doesn’t just happen on it’s own however. It takes a little strategy and planning. Otherwise, earning that kind of income would hit us with a big tax bill. Here are the different steps we would have to take in order to maximize our income and optimize our taxes with an extra $42K of income. Note – These changes are all highlighted in red on figure #2. One last item … since my pension is only tied to my full-time job, no additional savings would come out of that bucket to save us even more. So there you have it … we can push our income by approximately $42,000 more dollars and only pay $51 of federal tax this year. I can’t believe that for the past 20+ years of my working career … I never paid much attention to tax optimization. Even though the most recent tax law changes have really helped our family keep more of our income … we still could have saved more in the past if we would have been optimized. In the future there is bound to be different tax law changes put into place. Our income situation will likely change. So what you see here today for our 2018 tax optimization will likely be different in 5 or 10 years. But if we can continue to keep track of our income and use the tools available to our situation … I am sure we can continue to keep more of our income instead of paying it in taxes. 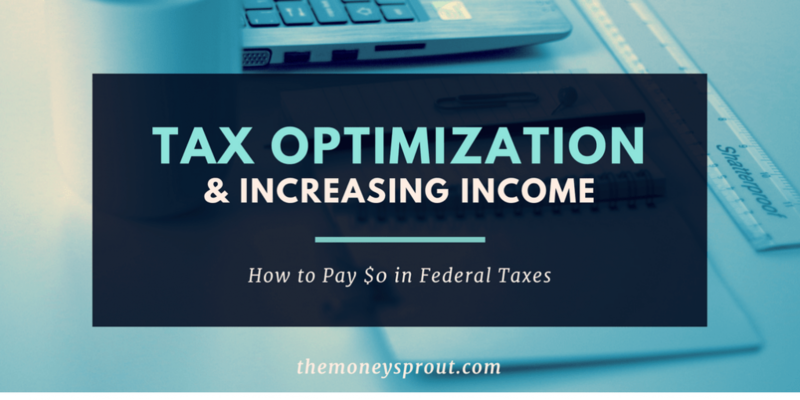 Are you taking advantage of tax optimization to keep more of your income? What strategies are you using?